The Great Crusade that has taken humanity into the stars continues. The Emperor of mankind has handed the reins of command to his favoured son, the Warmaster Horus. Yet all is not well in the armies of the Imperium. Horus is still battling against the jealousy and resentment of his brother primarchs and, when he is injured in combat on the planet Davin, he must also battle his inner daemon. With all the temptations that Chaos has to offer, can the weakened Horus resist? The epic tale of The Horus Heresy continues in the sequel to Horus Rising. The fate of the galaxy now rests in the simple choice of one man; loyalty or heresy? And now the biggie…The Horus Heresy. When the idea of this was first suggested to me, I didn’t know quite what to feel. On the one hand I was being asked to write the second book of three in the opening trilogy of what had to be the biggest thing the Black Library had done to date, which was both immensely flattering and scary at the same time. On the other, I didn’t know whether opening such a legendary time up to novelisation was a good idea. Happily, such doubts were set aside when we had our first meeting on the subject in Black Library Towers. Myself, Dan Abnett and Ben Counter amongst others sat around a table with Black Library’s Marc Gascoigne and Lindsey Priestley to have a chat with Games Workshop background guru, Alan Merrett to talk all things Heresy-related. We’d talked about all the things that made the time of the Great Crusade different from that of 40k and all the different ways we could make this series of books fundamentally ‘other’ than books set in the time of the Imperium we all know and love. I hastily began scribbling out my notes and working up ideas and characters for my book, as Dan began writing what was to become Horus Rising. As portions of Dan’s book came through, my trepidation in following in his footsteps grew with every page I read. Horus Rising wasn’t just a good book, it was a great book, and I hadn’t read anything as exciting in years. That excitement wasn’t as a result of any battles or fighting, but the sheer pleasure to be had in reading what had happened all those millennia ago. This walked, talked and breathed in a way no other books published by the Black Library ever had. If felt different, it felt real…and now I had to follow it up. So I read Horus Rising again and again. I read it at least five or six times before I even put finger to keyboard, since I needed to know these characters as though they were my own. I needed to know how Ignace Karkasy and Euphrati Keeler spoke, what Mersadie Oliton or Garviel Loken would do in any given situation and, most important of all, how Horus had changed since the end of Horus Rising. That, for me, was one of the key issues in my book, for Dan had managed to turn everything I thought I knew about Horus on its head. In every piece of fiction or text I’d written for Games Workshop about Chaos, I’d talked about how Horus had spat on his oaths of loyalty and turned his back on the Emperor as though he were the most despicable cad, but now I was confronted by a Horus who was a great man, a true hero and a character I really liked! That was the genius of Horus Rising in my opinion, that it played with our expectations and made us re-evaluate what we thought we knew about the Warmaster. After all this, I knew that I had a lot of work ahead of me. Not only did I have to make sure that the characters stayed true to what Dan had created, but I wanted to get all the incidental details he’d invented and get them into my book so that if felt like the second book in the trilogy rather than simply a book set at roughly the same time. During the writing of the book, Dan and I were in regular contact, via e-mail and phone to discuss various plot points, characters and to natter about the series as a whole. All of this was immensely helpful and I know that False Gods would be the poorer without the lines of communication remaining open during its writing. The main thing that struck me while writing the book was how much fun it was to have characters that have lived in my imagination since first reading of the Horus Heresy in the old hardback, Slaves to Darkness, long ago, walking and talking across the page. It was a constant thrill and terror to have them there as, here I was, writing a book set in the most pivotal time of the Imperium! 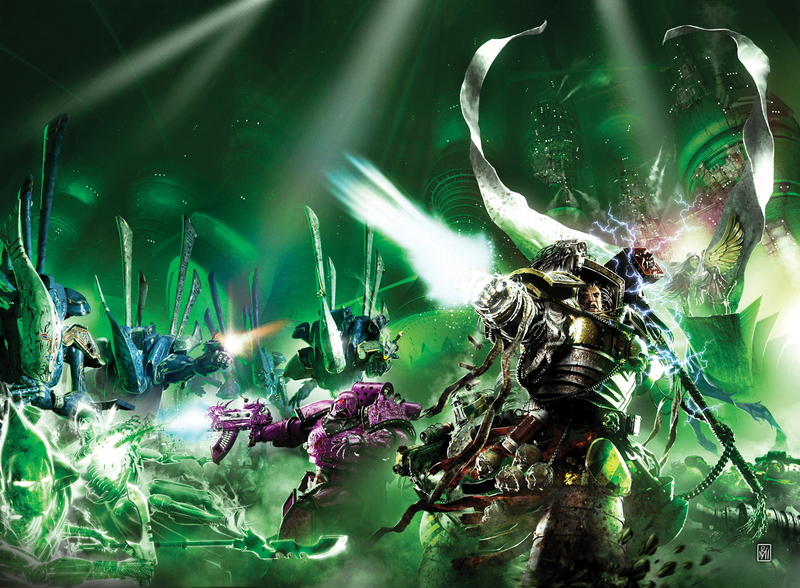 Events in Warhammer 40,000 don’t come any bigger than the Horus Heresy and the responsibility to get it right was huge. However, having finished the book, I was very proud of what I’d achieved. Reading it back, I think I nailed the style and tone of the book to follow Dan’s book and left enough threads hanging that Ben would have something to play with when he came to write Galaxy in Flames, the book that would follow on from False Gods.